Electric security strike - Destruction resisting power : 1000 Kg. The fail safe version of this door strike is specially designed for locking doors in escape routes. As a result of reliable unlocking under max. 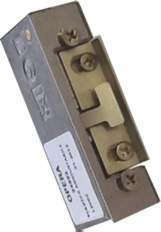 5000 N side load, this security door strike is also used on doors that are not subject to escape route requirements. In interlocking systems, sound-proofed doors and doors where pressure is expected on the keeper, this series guarantees reliable functioning. 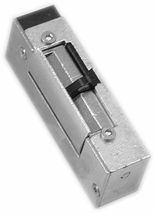 When the latch bolt locks into keeper, the door position is monitored (monitoring contact).